Fac-similé du manuscrit. Saint-Pétersbourg, 1909-1910. Études et commentaries par Louis Cyr, Jean-Jacques Eigeldinger, Pierre Wissmer. Geneva: 1985. 35 x 46 cm, 167, 61 pp. isbn 2-8255-0050-8. After the success of the Parisian ballet season of 1909 Diaghilev thought of creating a ballet after a Russian tale "The Firebird". Its scenography was the work of his entourage, mainly Fokine. Diaghilev considered first Liadov for the music but in 1909 he asked Stravinsky to do it. 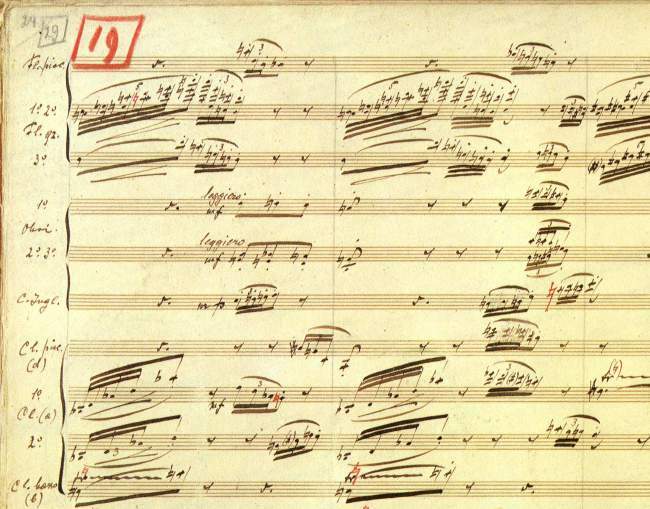 On May 18, 1910 the score was completed and on June 25, the work was performed with great success at the Paris Opera. It was the composer's first visit to Paris as well as his introduction to the European musical scene. The original manuscript of the Firebird has been in the possession of the Conservatoire de Musique de Genève since 1920, a gift of Jean Bartholoni, who probably bought it from Stravinsky in 1918. The edition: Deluxe full-color facsimile in the original folio format of the orchestral score of the complete ballet composed in St. Petersburg, 1909-1910. Published by the Conservatoire de Musique de Genève on the occasion of their 150th anniversary. Commentary in French and English. Fine bibliophile limited edition of 500 copies. Handsome binding with paper boards and vellum spine. Sold out.